In the upcoming issue of the journal IEEE Transactions on Information Theory, researchers from MIT, Tel Aviv University and Google prove mathematically and explain a new coding scheme that guarantees the fastest possible delivery of data over fluctuating wireless connections. Their system uses a strategy that sends the codeword in sections without repeating transmissions and stops once the receiver has received enough symbols to decode the underlying message. Wireless devices, such as cellphones or Wi-Fi transmitters, regularly send out test messages to gauge noise levels, so they can adjust their codes accordingly. But as anyone who’s used a cellphone knows, reception quality can vary at locations just a few feet apart — or even at a single location. Noise measurements can rapidly become outdated, and wireless devices routinely end up using codewords that are too long, squandering bandwidth, or too short, making accurate decoding impossible. 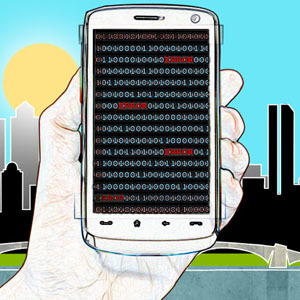 In the next issue of the journal IEEE Transactions on Information Theory, Gregory Wornell, a professor in the Department of Electrical Engineering and Computer Science at MIT, Uri Erez at Tel Aviv University in Israel and Mitchell Trott at Google describe a new coding scheme that guarantees the fastest possible delivery of data over fluctuating wireless connections without requiring prior knowledge of noise levels. The researchers also received a U.S. patent for the technique in September. Say, for instance, that the long codeword — call it the master codeword — consists of 30,000 symbols. The first 10,000 symbols might be the ideal encoding if there’s a minimum level of noise in the channel. But if there’s more noise, the receiver might need the next 5,000 symbols as well, or the next 7,374. If there’s a lot of noise, the receiver might require almost all of the 30,000 symbols. But once it has received enough symbols to decode the underlying message, it signals the sender to stop. In the paper, the researchers prove mathematically that at that point, the length of the received codeword is the shortest possible length given the channel’s noise properties — even if they’ve been fluctuating. To produce their master codeword, the researchers first split the message to be sent into several — for example, three — fragments of equal length. They encode each of those fragments using existing error-correcting codes, such as Gallager codes, a very efficient class of codes common in wireless communication. Then they multiply each of the resulting codewords by a different number and add the results together. That produces the first chunk of the master codeword. Then they multiply the codewords by a different set of numbers and add those results, producing the second chunk of the master codeword, and so on. In order to decode a message, the receiver needs to know the numbers by which the codewords were multiplied. Those numbers — along with the number of fragments into which the initial message is divided and the size of the chunks of the master codeword — depend on the expected variability of the communications channel. Wornell surmises, however, that a few standard configurations will suffice for most wireless applications. The only chunk of the master codeword that must be transmitted in its entirety is the first. Thereafter, the receiver could complete the decoding with only partial chunks. So the size of the initial chunk is calibrated to the highest possible channel quality that can be expected for a particular application. Be the first to comment on "Coding Scheme Guarantees Fastest Possible Delivery of Data"